We’ve all heard about medical treatments that come from the Far East (herbal remedies are all the rage these days). But did you know that one of the oldest Far Eastern treatments has been used to cure sleep apnea? Acupuncture originated in China, and today is practiced throughout the world. It has been shown to cure or alleviate many different health problems, from migraines to back pain to infertility. 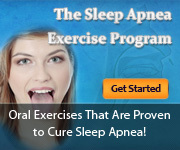 Okay, so what does this have to do with sleep apnea? It’s a little-known fact that acupuncture can cure sleep apnea. And it’s effect on sleep apnea has been proven in clinical trials. But before we get into that, let’s start with a quick description of what acupuncture is. The ancient Chinese compared the body to streams, rivers, creeks, and other bodies of water. They referred to “meridians” in the body, which were like streams running through the body. But instead of water, it was said that *energy* flowed through these streams in the body. The Chinese believed that energy could get “blocked” in the body, and that this could lead to many health problems. What acupuncture does is un-blocks the energy in our body, so the energy flows freely. Acupuncturists do this by inserting needles in certain “acupuncture points” in the body. Prior to beginning an acupuncture treatment, a practitioner examines parts of the body not normally considered by western doctors. This includes the texture of the tongue, soles of the feet and other areas which shed light on total body condition. From a Western science perspective, the flow of energy in the body is the equivalent of “nerve transmission”. When needles are inserted into the body, the needle stimulates nerve endings. This can lead to healing, and it can also lead to increased muscle tone. The part about increased muscle tone is most important for sleep apnea sufferers. Increased muscle tone (in the throat/airway) is what you need to prevent your airway from collapsing during sleep. If you’d like to see the results of a scientific study on acupuncture and sleep apnea, make sure to check out this link. And for a good WebMD article on acupuncture and sleep apnea, go here. more about the many options you have to throw away your CPAP! Marc MacDonald is an independent sleep apnea researcher. His newest book, “Cure Your Sleep Apnea Without CPAP: 9 Survivors Tell Their Story” helps sleep apnea sufferers to take action to cure their sleep apnea through 7 proven treatments.